Pizzas are one of the most frequently eaten foods among youngsters around the world. 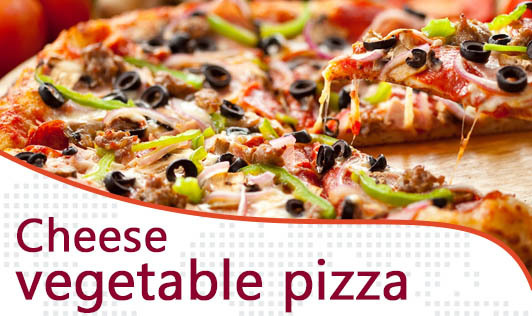 The first thing that comes to your mind when one thinks of pizzas are cheese and veggies. The flavor of herbs and the coat of creamy cheese and sautéed veggies is something that one can simply fall in love with. Heat the butter in a pan, add all the vegetables and sauté for 2 to 3 minutes. Season with salt and pepper and keep aside. Heat the butter in a pan. Add the flour and cook for 1 minute. Slowly add 1/2 cup of water, stirring continuously so that no lumps form. Add the milk, cheese, salt and pepper and bring to a boil, while stirring continuously. Place one herb pizza base on a greased baking tray. Spread half the cheese sauce on top of the base and then top with half the vegetables. Spoon half the tomato sauce decoratively over the vegetables and then sprinkle 1/4 cup of grated cheese on top. Bake in a preheated oven at 200°c for 20 minutes or till the base is evenly browned. Repeat with the remaining ingredients to make 3 more pizzas.